Fish’s eyeballs are one of my son’s favorite foods, and no, I am not kidding. When you ask him what he wants to eat, he will answer either pizza or fish’s eyeball. While they are completely different food items, they do have one thing in common – they make him feel good. Pizza reminds him of birthday celebrations or special occasions at school, and fish eyeballs make him feel esteemed because of people’s reactions when he eats them. So, keeping that principle in your mind, let’s talk about ways to feed your picky toddlers healthy foods by making the food appealing to their minds! This post contains affiliate links, for more info click here. 1. Pass the duck test. “If it looks like a duck, swims like a duck, and quacks like a duck, then it probably is a duck.” If your toddler likes pizza, then make his meal look like a pizza and cut it like a pizza. For example, I make an omelet nice and round, put “toppings” on it like mushrooms and broccoli, and cut it into wedges with a pizza cutter. And even though my son knows it’s not a pizza, he picks up a “slice” of omelet and exclaims “pizza!” and eats it happily just because it imitates the experience of eating a pizza. Same with fries – they love eating carrots, butternut squash, sweet potatoes, etc. better when they are in the shape of fries (aka sticks)! 2. Sharp instruments to the rescue. Half of the time, my toddler refuses to eat because he is simply too fidgety to sit still and perform the “boring” act of eating. So instead of cutting his food into little pieces, I let him do the cutting. My toddler loves using a pizza cutter to cut his sandwiches into smaller bites, or a knife (with me watching his little fingers like a hawk of course) to slice his meat. Trust me, the temptation of using a sharp instrument is just too hard to resist. However, make sure you implement the golden rule – you have to finish the food in your mouth before cutting another piece! 3. Bring on the dips! Dips are fun! Admit it, even you think so. So, bring on the cream cheese, guacamole, Greek yogurt, or whatever dip is appropriate for the meal. Sometimes, I make creamy soups like broccoli and cheese soup extra thick and give my toddler pieces of bread cut into strips for dinner. Give him a spoon for the soup, he will eat a couple of bites and call it quits. Give him bread to dip in the soup? He will finish the entire bowl! 4. Cookie cutters cut more than cookies. Seriously, a butterfly-shaped pancake tastes sooooo much better than just a plain round pancake. Just ask my toddler! You can use metal cookie cutters in a non-stick pan for pancakes in the morning to create all kinds of pancake creatures. I also use cookie cutters to make fun shapes out of sandwiches and sometimes even quesadillas. There are even special sandwich and bread crust cutters that help remove the crust as well as cut the sandwich into awesome shapes like dinosaurs and hearts. 5. Edible arrangements are not just for special occasions. 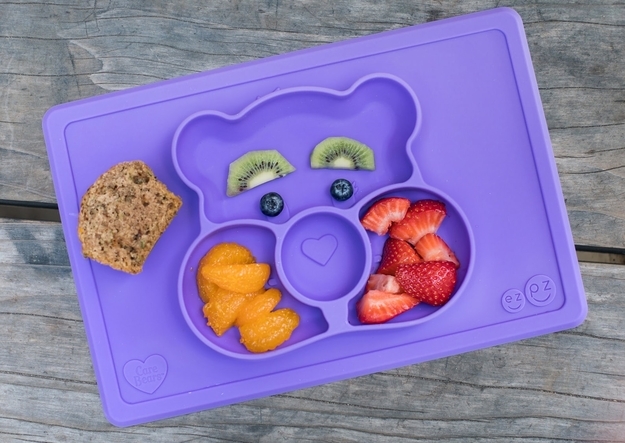 Similar to the cookie cutter idea, you can arrange your food in different shapes to make eating fun. For example, for my son’s 2nd birthday party, I made caterpillars out of grapes, ladybugs out of tomatoes and olives, snails out of pizza crust, and butterflies out of celery sticks and pretzels. The kids couldn’t wait to dig their hands into the food just because they look like bugs, and there were definitely some picky eaters in that bunch. So, tap into your creative side and come up with food art that your toddler will be sure to gobble up! If you are having trouble coming up with ideas, you can get dinner mats like the ezpz happy mats that may inspire you and your kid to be inventive and make dinner super fun! Plus, they suction to the table so your toddler won’t be able to launch his/her dinner across the room! 6. Transform food into hidden treasures. Out of sight, out of mind! If you really want your kid to eat a certain food and he/she just refuses to, then try hiding it from his/her sight. For example, your kid is not eating a fillet of salmon because he/she claims that he/she hates seafood, try chopping it up really small and making salmon fried rice. Then if they do end up eating it, reveal to them later that they just ate salmon and see, the world didn’t end and dinner actually ended up tasting pretty good. Another example would be if your kid hates eating his/her fruits and vegetables, try blending them with milk or yogurt into a smoothie. My children love drinking smoothies out of these reusable baby food pouches, and I am happy to let them because they are spill-free and easy to grab when we are on-the-go! 7. Shove the food in their mouths…literally! If fun shapes are not doing it for your picky eater, try fun utensils like this set of construction utensils! Fun utensils encourage picky kids to eat their food because that’s the only way they will get to play with the awesome tools! I know my toddler eats a lot more when he gets to use these marine animal food picks instead of a regular fork. And instead of just a boring spoon, your kid can shove food in his/her mouth with a bulldozer! What kid can resist that? A change of scenery may help divert a picky eater’s attention from his/her hatred for the food just long enough to have a peaceful meal. If it’s a nice day out, pack up the food and head to a nearby park for a picnic. Instead of eating at the dining table, eat out on the deck and enjoy the sunset. It’s funny how a little fresh air may help with a kid’s appetite! Kids want what other kids have, and food is no exception. You can tell when we eat with friends that if another kid is eating, my son is thinking, “I can do it too!” Usually when we eat with others, we make sure the kids have the same food, otherwise they end up fighting over each other’s plates. Especially for moms whose spouses come home late and cannot make it for dinner, this is perfect for moms to have some company themselves while keeping their kids fed and happy! I know, the idea of your kids in the kitchen may be horrifying, but try and think outside the box. Your kid doesn’t have to be chopping vegetables or standing at the stovetop sautéing stir-fry; instead, give him/her simple tasks such as wiping vegetables clean or mixing a few sauces together. Empowering them to help out with dinner will help entice them to eat the food they had a hand in making, literally! For picky eaters, repetition is key. You don’t want to try something once and just give up. Look for different ways to expose your child to a particular food item and do not give up. My toddler did not eat meat until he was about 3 years old. I tried ground beef, chicken wings, burger, etc. – you name it, I cooked it. Then all the sudden, right after his third birthday, BAM, he became a meat-lover. He now sits and eats a piece of steak or inhales meat kabobs for dinner. So, you just never know! Subscribe to The Terrific Five today!